1. Rationally organized space, multiple sized pockets at various angles, easy access to all your gadgets. 2. With nylon and polyester materials, it is wear resistant and tear resistant for daily use. 3. Adjustable nylon strap allows you to adjust it easily and smoothly. 4. Wide padded strap makes it comfortable across your back and chest. 5. Lightweight and slim shape allows you to wear it freely. 6. Night reflective belt on the strap also can be used to fix the earphone, avoid tangle cables. 7. Reinforced zippers and magnetic snap effectively protect your items to be stolen. 8. Chic and trendy style makes you attractive in the crowd. 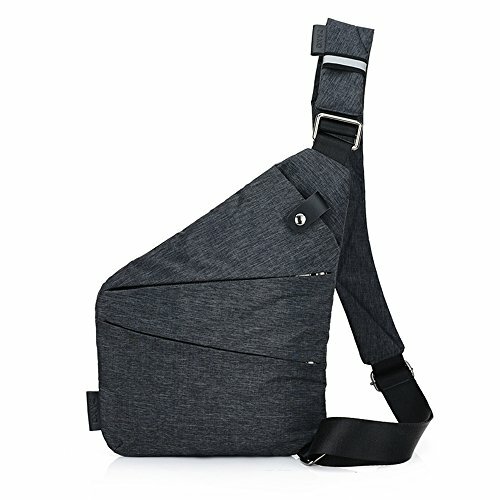 Wear Resistant Material: With 70% nylon and 30% polyester, this sling bag is wear resistant and tear resistant, perfect for business, outdoor sports, traveling, working, etc. If you have any questions about this product by Kvantym, contact us by completing and submitting the form below. If you are looking for a specif part number, please include it with your message.